Pequelin was a Knoppix-based Spanish live CD distribution designed specifically for children and educational use. Rate this project Elive is a Morphix-based Linux live CD designed for fans of the Enlightenment desktop environment. Version 0.3 is the project's first stable release: "Elive 0.3 released. This version includes hard disk installation, NVIDIA driver, the possibility to compile and install any program in the live CD system or install any extra package on the fly, stable and fully configured environment. With this version installed on the hard disk, you have an option to upgrade to another version with a simple apt-get upgrade." Also includes support for several languages, the second beta of OpenOffice.org 2.0, and the latest Enlightenment 17 straight from its CVS repository. Find more information on the distribution's home page. The ISO image is available for free download from here: elive-0.3.iso (646MB, MD5). 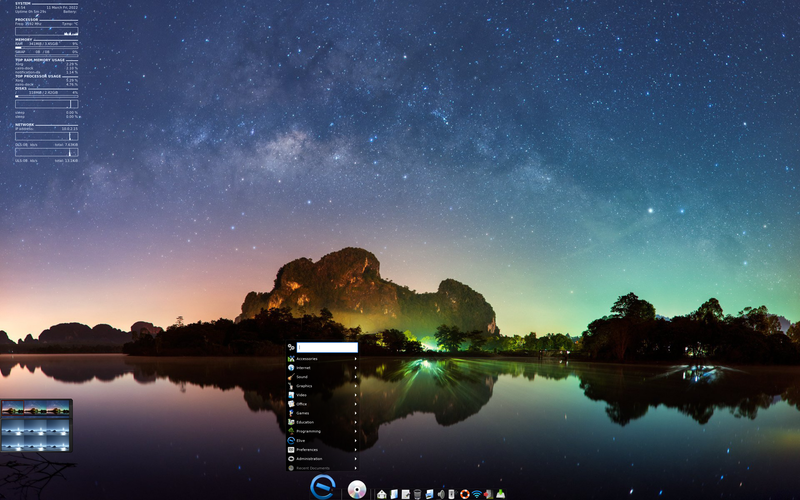 Samuel F. Baggen has announced the release of Elive 3.0.3, an updated build of the project's desktop-oriented Linux distribution based on Debian 7 "Wheezy" and featuring a highly customised Enlightenment 17 desktop: "The major stable release of Elive 3.0 has been updated. We were so pleased with this stable release of Elive and the result has been so amazing that there's almost nothing that needed to be changed from it. It was a truly a rock solid system and we wanted to update it with a slightly updated and polished build which includes: wallpaper - dynamically changes depending of the hour of the day, looking more magical and nicer for your eyes, and it also includes a hidden surprise for Christmas; pop-ups - you won't be annoyed any more by the Hotkeys Document that appears in the desktop startup, we moved it to the launcher bar of applications; desktop - disabled the screen off timeout and the asking for the presentation mode; Flash - updated the Adobe Flash player for common browsers to the last version, tested on Chrome, Firefox and Opera; multiuser - improved the multiple user desktop switching mode compatibility...." Read the rest of the release announcement for more details. Download (MD5, pkglist): elive_3.0.3_stable_hybrid.iso (3,114MB), elive_3.0.3_stable_usb.img (3,252MB). Samuel F. Baggen has announced the release of Elive 3.0.0, a major update of the project's Debian-based distribution with a customised Enlightenment 17 desktop user interface. This version is based on the 32-bit variant of Debian 7 "Wheezy" and, unlike the previous stable version (2.0, released more than eight years ago), Elive 3 is free of charge and unlimited in any way: "After 8 years of silent development, the third stable version of Elive is out. The result is simply amazing and the integration is gorgeous; it is not even possible to describe every inside feature. The new website only contains a small portion of its characteristics. Unfortunately not everything is rainbows and perfection and the lack of resources delayed the release being too much. This has lead to old packages and drivers, but despite that, the final result is really worth it. Elive 3.0 is the most useful system ever made, perfect for the daily use, rock solid, beautiful and full of hidden features, with every effort to make it usable for any user level. This version is most powerful, maintaining its lightness in resources and a blazing fast responsiveness. And even better, the final stable version is entirely cost-free and limitless, with all its features." See the release announcement for further information. Download (MD5, pkglist): elive_3.0.0_stable_hybrid.iso (3,133MB), elive_3.0.0_stable_usb.img (3,271MB). Elive is a Linux distribution featuring the Enlightenment desktop environment and based on Debian 8.0 "Jessie". The project has released a new development snapshot featuring improved language support for a number of Asian languages and reorganised desktop menus. The release announcement states: "The Elive team is proud to announce the release of the beta version 2.9.22. This new version includes: Keyboard typing to support special languages like Korean, Japanese, Chinese and Vietnamese. If you need an extra IBus configuration contact us with the details needed network access to your local machines using hostname.local. Numpad always enabled option in installation. Desktop right click is assigned to an amazing launcher. Designs shadow fix, borders more white, less pixelated icons in menus, much improved menus and user friendly, misc overall improvements. User friendly better organized menus, more friendly icons and names, improved description for the dock launchers." Download the live DVD/USB image from here: elive_2.9.22_beta_hybrid.iso (3,136MB, MD5, signature, pkglist). The Elive project is a desktop-oriented, Debian-based operating system. The Elive team has announced the release of a new development snapshot for Elive. The new beta carries the label Elive 2.9.8 and introduces a number of changes to make the system more efficient and convenient. "This new version includes: System: thanks to lots of improvements in the installer you can free up to 3 GB of the installed system and make the memory usage lighter up to 100 MB only, with the full desktop running. User Manager: includes now auto-login features and sudo configuration. Fonts: added a perfect selection of fonts for different purposes, also other ones for programming and small sizes, improved selection of international languages compatibility and removed unneeded ones. Desktop: improved gadgets distribution and compatibility, the disks gadget only shows the removable devices by default now. Installer: lots of bug fixes and improvements, extra options to remove unnecessary things, it supports now SSD over PCIe (nvme) hard disks, blank boot fix, automated partitioning and encryption options improvements, integrated tool to automatically report bugs, better reliability...." Additional details can be found in the distribution's release announcement. Download: elive_2.9.8_beta_hybrid.iso (3,028MB, MD5, signature, pkglist). The Elive team have announced the release of a new beta snapshot of the project's Debian-based distribution. Elive 2.9.5 (Beta) introduces a number of bug fixes and visual improvements as well as a new short-cut for vim users. The release announcement lists the new changes: "The Elive Team is proud to announce the release of the beta version 2.9.5 Designs: Great improvements in the designs for the stable release! Overall cleanup, lots of transparent elements, logo animated at start, shadows 3D effect, clock design. Unique features: The borders have now 4 buttons instead of 3, and there's a hidden one that appears if a window cannot be closed. Effects: The visual effects stability is improved specially in the Live mode and there's a fix for the locked desktop when using it. Eltrans: Our translator tool has the counter for translated sentences fixed and there's a fix in the grammar checker. Please be a translator before the stable release! Extra: you can use Ctrl+s in vim to save files now, tagbar feature also recognizes EDC source files which makes them very handy to browse elements!" Download: elive_2.9.5_beta_hybrid.iso (2,996MB, MD5, signature, torrent, pkglist). The Elive developers have announced the availability of a new beta snapshot of their Debian-based desktop distribution. The new development release, Elive 2.8.6, offers several performance improvements, an updated application menu and easier access to removable media. "This release includes a good amount of performance optimizations, raising the performance in live mode to be twice as fast!, check the entry in our Facebook page to see specific details. There’s also a good amount of boot configurations that improves greatly the performance in old computers too, in a funny way, this version number reminds to a classic computer introduced in 1982 on which a good amount of people has started using computers." The Compiz package has also been updated with stability improvements: "Compiz - improved stability and configurations to have good eye candy in combination with speed and useful features, a very old and important bug was finally fixed making it a stable environment for daily work." Further information can be found in the project's release notes. Download: elive_2.8.6_beta_hybrid.iso (3,069MB, MD5, signature, pkglist). The Elive distribution is a Debian-based project featuring the Enlightenment window manager. The project has released a new development version, Elive 2.8.0. The new development release features an improved welcome panel, desktop performance improvements and thumbnail previews for Epub and Mobi document files. "The Elive Team is proud to announce the release of the beta version 2.8.0. This new version includes: Designs preview feature included. GIMP - much improved with a more intuitive and useful interface, expanded navigation and direct access to handy tools. Fixes in the desktop stability and performance bottleneck that was caused by a small cache. Ebook creator tool from web articles greatly improved(cli). Thumbnails for Epub and Mobi files. Welcome panel with multiple fixes. Timezone and Time compatibility with shared Windows systems and improvements in the detection and re-using of configurations." Additional reading can be found in the project's release announcement. Download: elive_2.8.0_beta_hybrid.iso (2,720MB, MD5, signature, pkglist). The Elive project has announced a new beta release of their Debian-based distribution. The new development snapshot, Elive 2.7.6 (beta), includes a welcome panel in the distribution's live mode, offers faster application launches and the default shell has been switched from bash to zsh. "When you run the applications by the first time they take some time to start, for example the chromium browser takes 9.3 seconds, so I was playing with magical voodoo pre-caching techniques and it was improved to be only 3.6 seconds. But because I'm a crazy maniac this was not enough, so I was finally able to make it take only 1.3 seconds, in the same way LibreOffice was taking 18 seconds to start and now takes 1.5 seconds. You can enjoy the speed of light in live mode starting with this version. Remember, we need your feedback; each new beta version could include things not working as expected, if this is the case please contact us so that we can fix the problem." Additional information can be found in the project's release announcement. Download: elive_2.7.6_beta_hybrid.iso (2,666MB, pkglist). Elive 2.6.12, the latest development build of the project's commercial distribution based on Debian GNU/Linux and featuring a highly customised Enlightenment desktop, is out and ready for testing: "The Elive team is proud to announce the release of the beta version 2.6.12. This version includes bug fixes in the installer handling special cases and some improvements in the overall speed process. The desktop has the clock by default included now and there are some improved configurations too. We are still working on the packaging for other architectures like the x86_64 and different distros to keep the updates and fixes more reliable in the future. We need your feedback and reports as each version can include new things that do not work as expected; if this is the case please contact us on our live chat or report it to on the website. Beta versions are not optimized due to debug flags and developer profiles." Here is the brief release announcement. Download: elive_2.6.12_beta_hybrid.iso (2,430MB, MD5).